This entry was posted on December 18, 2015 by Vinilismo. The pictures are an element of great importance in the decoration of houses. An important frame by their dimensions, colors or artistic value table can be the starting point for the rest of the elements and colors used in space. As less glamorous option, the pictures are also a great help to cover imperfections, marks or stains on the walls. But do not make the mistake of placing these decorative elements without planning how they will adapt best to your place and your style. For your bedroom, an interesting option is to align a large or several small frame on the back of your bed, so that it matches the width. Also in your bedroom, or any other room, you can choose to perform a geometric composition with squares of different sizes. Place two, three or more tables together to achieve a sense of "unity". Place pictures on a ledge or shelf is a versatile alternative. It lets you combine them with other decorations, books and small sculptures. It also prevents the annoying drilling walls and is especially interesting for those who like to redecorate periodically. You simply change your location or replace it by others. A simple and useful decoration trick with paintings use to hide or cover internal spaces on the walls, for example, the electrical box. Just set a paint at the door of it. The pictures you use may be original paintings, reproductions, or your authorship. You can also frame pictures of the children in the family, and objects of personal significance as covers of old records, photographs or letters from thousands of possibilities. 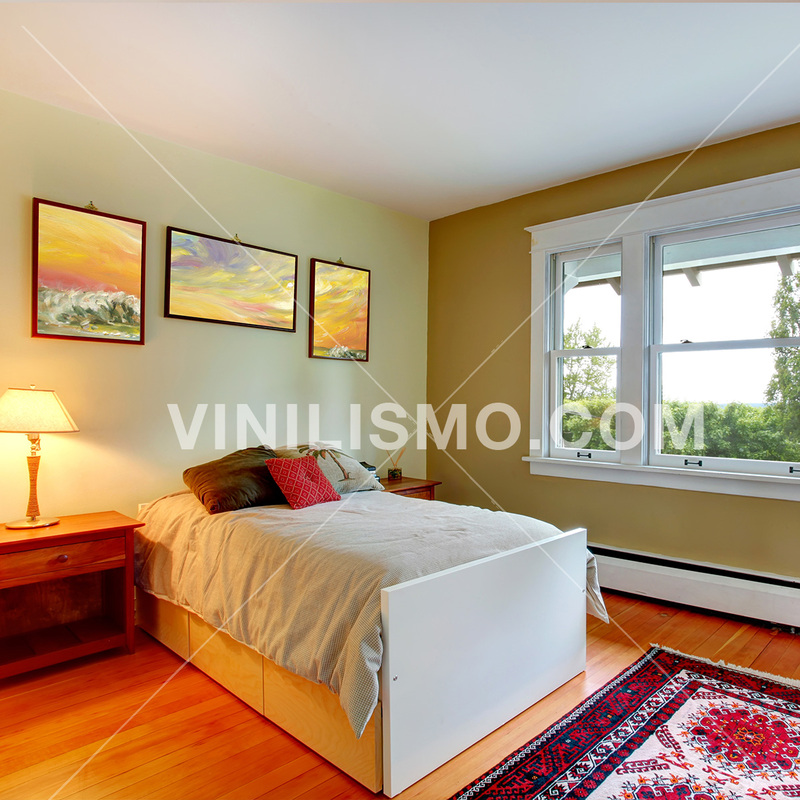 Another option is to place vinyl sheets made for a modern style in the decoration of houses. The wall decals can be helpful when carrying out your home decorating project with pictures, either as material for the sheets or in addition to the arrangement thereof in your walls. Choose the shape, pattern or artwork of your choice and encárgalo in the size you prefer in our store. Remember that the decals are highly customizable: whether they want a reproduction of a Picasso, a photo of the Beatles or image designed for you, the vinyls are an excellent answer. Also to plan the decor of the rooms of the children, who enjoy a picture with one of his heroes of film and television. The sheets can be framed or applied directly on the walls. Another original idea is to complement the arrangement of his pictures with vinyl appliques. You can put your creativity to walk: the idea is that the pictures and designs on vinyl are integrated. For example, if you frame shots of your family, you can integrate with a tree made of vinyl, that refers to a family tree. As you can see the ideas are endless when decorating with pictures supplemented with wall decals.